Mike & Cindy Jacobs of the United States Reformation Prayer Network have asked each of the states to join them in a national prayer initiative for 2010. They are calling this initiative "ROOT 52″ because it is a 52-week prayer strategy to bring the nation back to it's covenant roots. A torch of prayer and fasting will go "en-route" from state-to-state in the sequence that they joined the Union and came to form the United States of America. 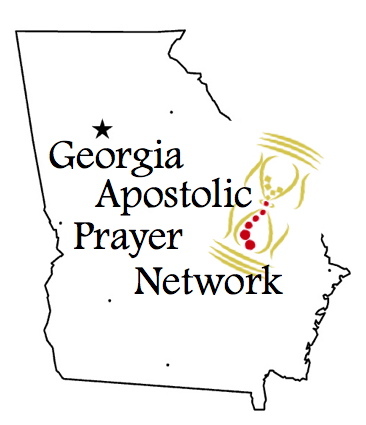 Georgia's week of prayer and fasting will be February 5-12. (We will be providing more information specific to Georgia closer to this date.) Read on for more details. Update: The Lilburn City Council denied the request for rezoning & special land use permit (for the cemetery). Keep praying as there has been a promise of a lawsuit if denied. This is clearly a legal decision based on zoning criteria that should stand, but we are called to pray it through to the end. It is today as it was in the when Nehemiah declared and instructed those who were rebuidling the wall of Jerusalem. "Then I said to the nobles, the rulers, and the rest of the people, "The work is great and extensive, and we are separated far from one another on the wall. 20 Wherever you hear the sound of the trumpet, rally to us there. Our God will fight for us." (Nehemial 4:19-20) The suburb-of-Atlanta town, Lilburn, that I live in is currently facing a challenging situation over the proposed development of a Dar-e Abbas Islamic Center. On Thursday evening, we gathered to worship, intercede and release prophetic proclamations over our city and state. The presence of the Lord was tangible as we come together "as one" - to build relationships as the Family of God, so that we might go out as the Army of God to advance Christ's Kingdom. It was a glorious evening and we are looking forward to more across the city and state in the months to come as we answer the call of the Lord to Rally the Troops month by month for His purposes. God has issued a call for a rallying of the troops from city to city, community to community to bring His Kingdom rule and reign "on earth as it is in heaven." The following is a pattern the Lord has given to assist in rallying the troops in your community. Today many are sensing that things are deficient and out of order in the Church of the 21st century, especially in the American Church. Dutch Sheets points out that in his grandfather’s generation, 65% of them were born again and active in their faith. In his father’s generation it went down to 35%. Then in his generation, it drops down to 15%. The most alarming statistic is that we are told today’s generation--the youth of our nation--is probably around 4% that call themselves true followers of Christ. When you add these sad statistics to the recent scandals among the leadership of churches and ministries which, by the way, have so diminished our credibility that it will take years to restore, you can’t help but cry out for change! The Church desperately needs revival and beyond revival, we need a massive reformation. The Church must change! We have identified five Foundation Pillars For The Reformation Of The Church . . .
We have entered into a new season and a new level of warfare, unlike what we have seen before, and we must not shrink back or allow the enemy to distract us from the assignments of the Lord in this season. There is a promised land ahead of us, and much like the children of Israel, after God had removed Moses and moved Joshua into the place of leadership. We must quickly adapt to the new and refrain from looking back to "the way things used to be." As in the transition from the leadership of Moses to that of Joshua, so today, we must shift from what has been and the ways we have operated in the past into the new season of entering into new warfare to occupy the promised land that lies before us. This new season requires a new fervency of intercession. Let's shift and advance! Simply turn on the nightly news for five minutes, perhaps even less, and you will be confronted with a myriad of reasons to shirk back simply to avoid the onslaught of terror-producing news and commentaries that flood the airwaves. God wants us to live victoriously by faith as radical disciples that are not shaken when everything else is shaking. This article presents seven keys to living as faithful disciples when fear and terror are raging all around us. A look at Psalm 78 as a model for leadership that is governed by integrity and executed by skillfulness that brings honor to the Lord and releases the blessings of God into a congregation, community, city or even, a nation. The verse that has struck me so deeply this week is at the very end. Psalm 78:72 reads: "So he shepherded them according to the integrity of his heart, And guided them with his skillful hands." What I am hearing in this is yet another reminder that God is looking for leaders who will lead according like this. Remember that scripture says that David was a man after God's own heart. He wasn't perfect; his faults are recorded right alongside his victories. But, he was a man who pursued knowing the Lord with a whole heart, and to lead according to what God revealed to him. In late 2006, the Lord released a directive word through Prophet Chuck Pierce that set us on a journey to tear down the high places that have held this region captive for generations. This journey has had us engage in a number of components over the last eighteen months, and more are coming! Our first step, in this assignment, was to travel ï¿½to Stonehenge and sever the leyline from there to those stones (Guidestones) up in the north of your state and break the reproach of alignment with Stonehenge - get your state free from under that thing.ï¿½ To date, we have traveled to Stonehenge, conducted two land initiatives at the Georgia Guidestones and now, one member of our team - Deborah Landwerlen, is on her way back to be a part of a worship gathering at Stonehenge. Read on for a comprehensive report, with an emphasis on the weekend of February 29-March 1, 2008. Even as Gideon tore down the altars of Baal at the word of the Lord, so are we called to tear down the altars of Baal and the high places in our day. According to the Word of God and the revelation of His instruction to us in this season, we are called to wage war against the powers of darkness that are oppressing our region. When Chuck Pierce released the prophetic word about the region starting the change within 21 days, this weekend to "Take Down the High Places: A Weekend to Advance" was already planned at the word of the Lord as a strategic time to deal with the Baal structures over this region. We receive this word as a confirmation of the Lord's hand resting heavy upon this assignment to release the region from the heavy oppression of the enemy that steals and kills true faith, and to release the region into a divine season of faith being birthed in a new way.